"Doo-Wop Wed Widing Hood" Is the Junior Musical on Jan. 18 and 19! Rehearsals for the Junior Musical production are well underway! 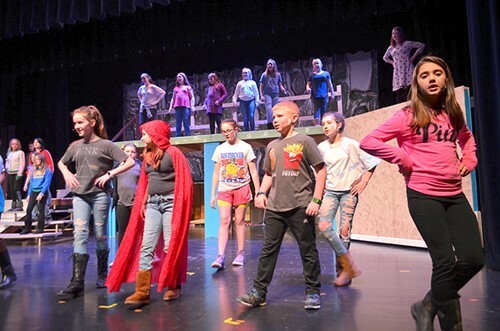 Our students in grades 5 through 7 will offer performances of "Doo-Wop Wed Widing Hood" on Friday, January 18 at 7 p.m. and Saturday, January 19 at 10 a.m. The story is based on the fairy-tale of Little Red Riding Hood--with a 1950’s twist. The play starts out in the Hood household, where we meet Mr. Hood- Emma Peck, and Mrs. Hood- Alyssa Sorochinsky. Later we meet their three daughters: Little Red Riding Hood- Avriel Correll, Medium Purple Riding Hood- Kyra Demmon, and Big Green Riding Hood- Natalie Raymond. The Hood family enjoys watching television as Little Red goes out to deliver cookies to her grandmother- Mackenzie Barnes. At the palace of Wychwood-Under-Ooze, the King- Lindsay Turnbull, and Queen- Kylee O’Connell, have an announcement to make. Present at the announcement of the King and Queen are the Lords and Ladies in Waiting and the Lords of the Palace: Sophie- Paige Nichols, Emma- Dannaka Rasmussen, Elle- Jenna Carpenter, Tyler- Sean Downey, Jocelyn- Serenity Downey, Louisa- Kaleigh Gee, Molly- Maya Eberly, Rita- Olivia Fletcher, Elizabeth- Alexia Furgison, Elaina- Natalie Gross, Felicia- Bailey Howard, Brianna- Jaden Kuhn, Kinzie- Jade Lindroth, Lexus- Madison Lockwood, Brandon- Matthew Manwarren, Louis- Aidan Meeks, Katlyn – Lillian Perrine, Morgan- Alivia Plows, Perry- Blake SanSoucie, Payton – Jillian Scott, Jillian- Paige Smith, Anna- Trista Vaccaro, Gabrielle- Kaylin Williams, William- Adam Yasser, Christina- Autumn Yost, Emily- Elizabeth Yost, Catherine- Alivia Yost, and Steven – Matthew Zabrisky. The big announcement is the plan of the three princes to woo Red Riding Hood. To help select which Prince receives the great honor of marrying Red Riding Hood, the palace hired the Fairy Godmother- Hailee Walrod. The Fairy Godmother will set three tasks and the winner will woo Red Riding Hood. The news travels across the Kingdom via U.P.S. by Louise- Kadence Canfield. When she arrives to inform the Hood family about the Princes intentions to woo Little Red, Louise discovers that Little Red is off delivering cookies. The family is upset by the news because they will have no one to make and deliver cookies to grandmother. The family hires the Evil Queen- Ariana Cornell and her dragon, Oswald- Kyle Keuhn, and Gerald- Jeffrey Barnes to foil the plan. On her way to her grandmother’s cottage, Little Red meets the three princes: Strong Prince Justin- Tait Christensen, Wise Prince Jason- Devon Hartwell, and Loud Prince Frank- Ryan Davis. She also meets a Wolf- Brendon Eastman, who claims to have a surprise for a little old lady who lives in a cottage in the woods. Eventually, all of the characters in this fairy-tale become completely tangled-up! To help keep things straight there are two narrators: Ryan Beismer and Barbara Fletcher. You might ask “How does it end”? You will just have to come and see! Please mark your calendar for Friday, January 18th, 2018 at 7:00PM and Saturday, January 19th, 2019 at 2:00PM for a night or afternoon of laughter, dancing, and music from this wild adventure of Doo-Wop Wed Widing Hood! Under the direction of Gerrit Bakhuizen, is our amazing crew! We have many working behind the scenes including Anika Christensen and Nina D’Amato coaching our lines with us, as well as backstage with Emily Hammond. Noah Pain and Kendra Hammond are helping us with our lights and sound. Our posters, artwork, and props are provided by Cheri Theis. The design for our program, t-shirts, and posters were drawn by Kyra Demmon. We could not have done this without all of you!